(CBS/AP)ST. LOUIS - Rains that eased or stabilized parched conditions in some key farming states haven't helped growers and ranchers in Kansas or Nebraska, where the severity of the drought continues to spike, a climate monitoring center showed Thursday. The U.S. Drought Monitor map released Thursday showed that the amount of the contiguous U.S. mired in drought conditions dropped less than 1 percentage point to 61.8 percent as of Tuesday. The portion enduring extreme or exceptional drought  the two worst classifications  also eased, to 23.68 percent from 24.14 percent. 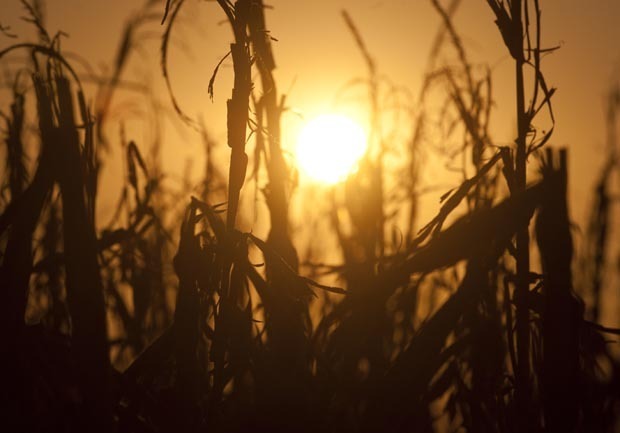 "Other areas, such as the Southern and Central Plains, were not as lucky and continued to dry out," the National Climatic Data Center's Michael Brewer wrote in the update, released weekly by the National Drought Mitigation Center at the University of Nebraska in Lincoln. The amount of land in Nebraska suffering exceptional drought spiked by 19 percentage points to 22.5 percent, while that number in Kansas jumped from 38.6 percent last week to 63.3 percent now. Illinois, another key supplier of corn and soybeans, saw its conditions abate slightly, with the amount of land in the two worst drought categories slipping from 81.18 percent to 79.54 percent. The U.S. Agriculture Department has twice slashed its forecast for this year's corn and soybean output because of the punishing drought in the nation's breadbasket. It forecast the nation's biggest harvest ever in the spring, when farmers planted 96.4 million acres of corn  the most since 1937. But the agency cut its estimate a month ago and again last Friday, saying it now expects the nation to produce 10.8 billion bushels, the least since 2006. If that estimate holds, the federal government says it will be enough to meet the world's needs and ensure there are no shortages. But experts say food prices will almost certainly climb as corn is a widely used ingredient found in many products including cosmetics, cereal, colas and candy bars. The drought is also affecting wildlife. CBS News correspondent Seth Doane reports that this year's hummingbird migration is complicated by the lack of natural wildflowers, which have been hit hard by drought and forest fires. So birds that are looking about for their usual food sources are heading elsewhere. Large numbers of birds are swarming feeding stations set up in gardens and backyards in drought areas out West.